Have all ingredients ready before beginning. Rinse any ice glaze from frozen Alaska Black Cod under cold water; pat dry with paper towel. Heat a heavy nonstick skillet over medium-high heat. Brush both sides of black cod with oil. Place black cod in heated skillet and cook, uncovered, about 3 to 4 minutes, until browned. Shake pan occasionally to keep fish from sticking. Add teriyaki sauce and cook 2 minutes more; sauce will boil up. Turn fillets over, add garlic and cook for 2 minutes. Add wine, bell pepper, green onions and carrot. Cover pan tightly and reduce heat to medium. Continue to cook an additional 6 to 8 minutes for frozen black cod or 3 to 4 minutes for fresh/thawed fish. Cook just until fish is opaque throughout. Sprinkle with lemon juice. 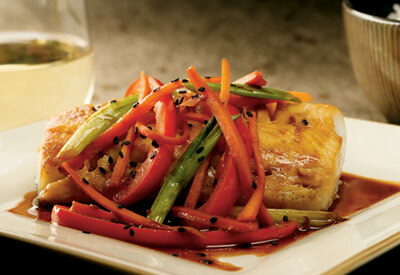 To serve, top fish with vegetables and sauce; garnish with lemon wedges and toasted sesame seeds, if desired. Serve with bowls of steamed jasmine rice on the side.